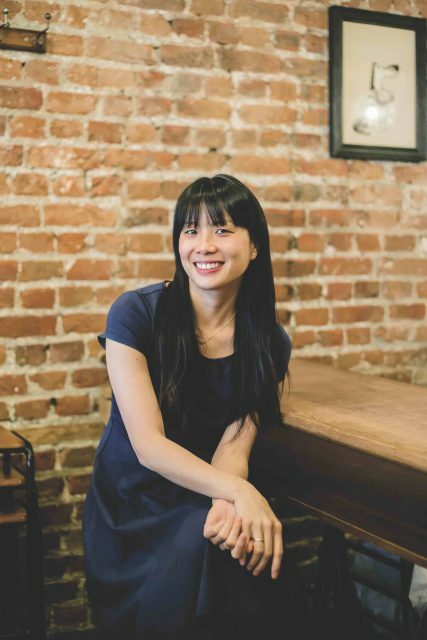 Chef-turned-sommelier Sandia Chang is from California. She moved to train at the internationally acclaimed Culinary Institute of America in New York, and chalked up stints at René Redzepi’s Noma in Copenhagen and Thomas Keller’s Per Se in New York (where she met her husband, James Knappett) before moving to London in 2010. Before founding Bubbledogs, and later Kitchen Table, Chang was assistant manager and wine buyer at Simon Rogan’s first Roganic iteration, and assistant manager at Marcus Wareing at The Berkeley. Experience at some of the world’s most respected restaurants led her to found Bubbledogs in 2012 with Knappett. Based at 70 Charlotte Street in Fitzrovia, Chang took on the role of general manager and sommelier, while Knappett manages proceedings behind the pass. Once unlikely bedfellows, Bubbledogs’ formula of grower Champagne and gourmet hot dogs made it an instant hit. So much so that the couple’s fine-dining concept, Kitchen Table, opened in a private dining room at the back of the restaurant shortly after, and was awarded a Michelin star in 2014. It has just picked up a second star in the 2019 edition of the Guide, which Chang described as “a bit surreal”. The 19-seat venue, set around a stainless-steel bar, features a 12- to 14-course tasting menu that changes daily. It is Chang’s work behind the scenes, however, that is less known. Making a point of knowing each of her suppliers personally, she makes regular visits to small-scale producers in Champagne, constantly on the lookout for wines to list. Her charm and warmth has seen her become a regular wine presenter on the long-running BBC series Saturday Kitchen, during which she selects the best-value supermarket wines to pair with dishes cooked by top chefs live on air. In recognition of her work, she was awarded ‘best front of house’ at the GQ Food and Drink Awards this year, while she and Knappett also picked up the ‘welcome and service award’ from Michelin. The Guide said that “they proved there could be harmony between the kitchen and service teams”. She has been praised by contemporaries such as cocktail maverick Ryan Chetiyawardana, for her “encyclopaedic knowledge” and “understanding of how important fun is when dealing with world-class offerings”.